Breastfeeding has a number of health benefits for you and your child. Not only does breastfeeding help strengthen bonding, but breastmilk also offers your baby with the unique balance of nutrients their body needs for healthy development. Studies have shown that exclusive breastfeeding helps to support baby’s healthy growth, lowers their risk of obesity and other health problems, and helps strengthen baby’s immune system. Most importantly, breastfeeding helps to reduce baby’s risk of Sudden Infant Death Syndrome (SIDS.) You can reap the benefits of breastfeeding too, with lowered risk of type 2 diabetes, and certain types of breast and ovarian cancers. The American Academy of Pediatrics recommends exclusive breastfeeding until a child is at least 6 months of age. There are a number of factors that can influence a mother’s decision to breastfeed her child. Many of these factors also contribute to the gap in breastfeeding rates between Black and White mothers. 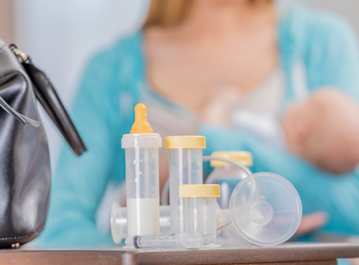 The Centers for Disease Control and Prevention identifies that if a mother is not given information about breastfeeding and its health benefits from health care providers, she is less likely to attempt to breastfeed her child. Healthy Start aims to Increase access to breastfeeding education and support services to close this gap, and to improve general understanding and acceptance of breastfeeding. This helps to create more supportive family, public and work environments. Studies have shown that if 90% of mothers breastfed exclusively for 6 months, about 1,000 infant deaths could be prevented every year.